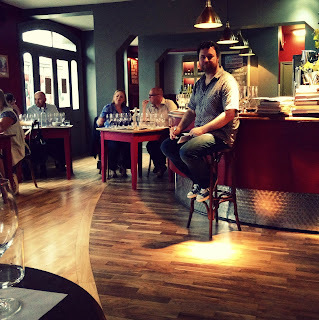 A few weeks ago, I was lucky enough to snap up some tickets to the very first wine tasting our "new local" was hosting. 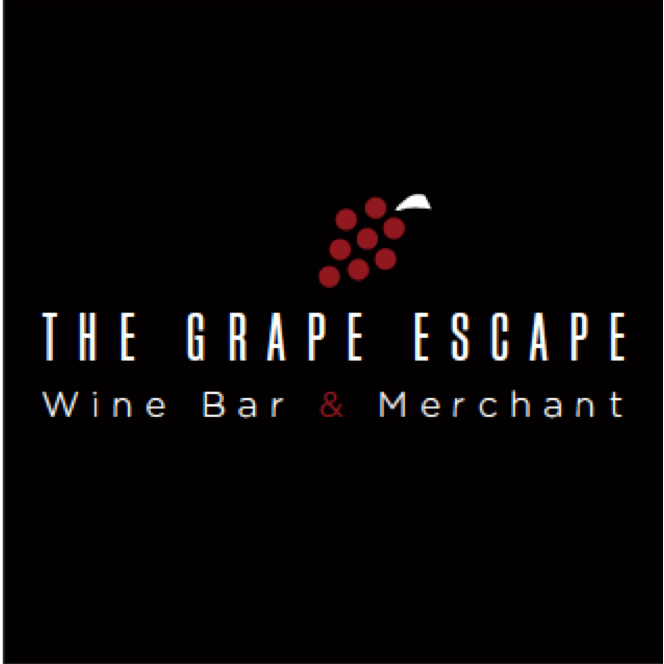 The Grape Escape opened in Cheltenham at the end of May, almost a stone's throw away from our house - excellent for staggering home purposes, but dangerous for the bank balance - and it's just perfect. There's an ever changing weekly wine by the glass list, with over 200 wines to purchase by the bottle, and you can buy to take home too (though it doesn't make much difference for me and The Chap, we'd rather be propping up the bar!). 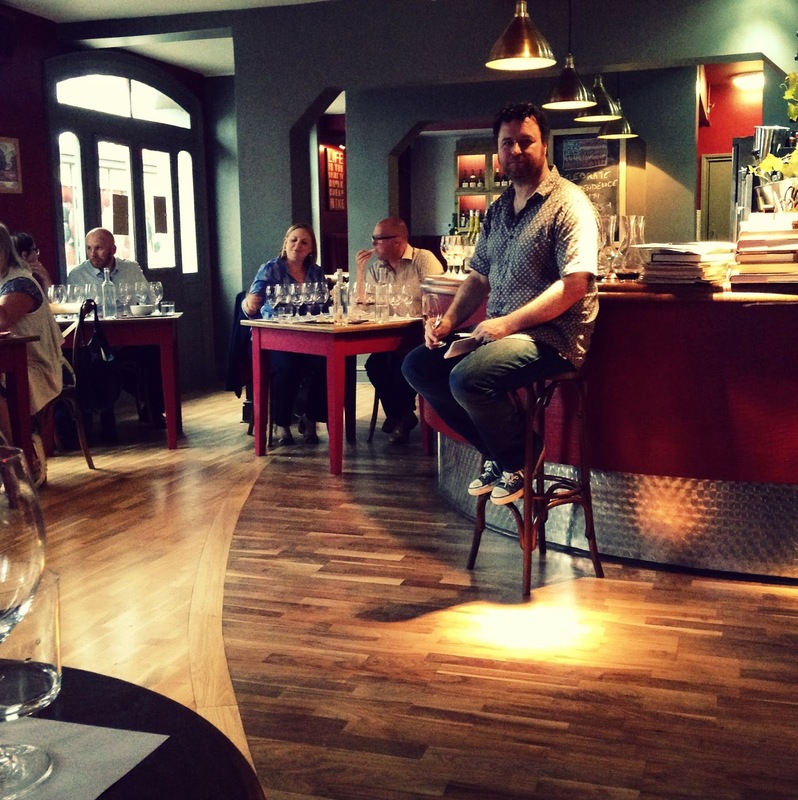 It'll come as no surprise then, that such a great wine bar is the brainchild of great wine enthusiasts; you might recognise Ant (and Zoe) from the Confessions of a Wine Geek blog - @winegeekconfess on Twitter - and also Tim's #NewWineThisWeek post back in February last year. With such excitement about all things grape, it's hard not to be bowled over by the pair, and if you don't leave with a smile and a feeling that you've had some terrific wine, then there must be something wrong with you. Anyway, their monthly tasting events kicked off with California. Cali was always going to be the first one; travelling around the wineries of the western state instilled Ant and Zoe with the drive to open up their own wine bar, and after returning home, they admitted to drinking nothing but Cali wines for 6 months! With such a rich history, this part of the USA seems to be producing some of the most exciting wines around. Being "too fruity" or "too oaky" is the general stereotype for Californian wines. A stereotype that is perhaps supported by the likes of Robert Parker, who tends to favour the full-bodied wines with big fruit, concentration and new oak; giving them great praise - and scoring them highly - panicking all other wineries into producing a similar style. There are some really fab wines, as you'd expect, but it's also created this homogenised, somewhat boring, output of wines that don't really have a sense of place. There is, however, a new 'movement' known as 'In Pursuit of Balance', or as Parker has referred to it, 'wine jihadists'. Some winemakers have taken it upon themselves to express the varieties they grow, and the places from which they grow them, regardless of the fact that they might not please the critics. The resulting wines are much more delicate and nuanced; with lower alcohol and far less new oak, they're wines that don't rely on you having food with them. Hurrah! With 4 whites and 4 reds, there’s a lot to talk about, so I’ll do this in 2 parts; you’ll get the red wines next week! We began with Viano 'Hillside White' NV, Contra Costa (retailing approx. £16). 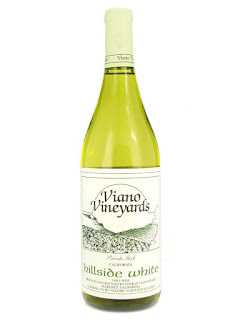 A blend of Chenin Blanc, Columbard, and probably the most un-cool grape, Muscat, this "house white" from Viano's old, dry-farmed vineyards (some of which date back to 1888) is quite the unusual one. It has the apple/pear/honey aromas from the Chenin, a tropical twist from the Columbard, and a grape-y-ness from the Muscat; overall producing something that's aromatic, floral, crisp and refreshing, with a unique but distinctively "winey" taste. It's no secret that I love Riesling, and luckily it's Ant's favourite grape too, so the Tatomer 'Kick-on-Ranch' Riesling 2011, Santa Barbara (retailing approx. £30) was inevitably going to be a corker, and there's quite the labour-of-love story behind it too. When starting out, winemaker Graham Tatomer was well and truly drawn in by the brightness and acidity of all the Germanic wines (particularly Riesling), to the point where he sourced some fruit from old Riesling vineyards and began making wine under his label. However, after sampling some of the best wines the old world had to offer, he thought they were so good that he immediately stopped making wine and moved to Austria to gain knowledge. When he returned home to California years later, he put everything he'd learned into practice, making top flight Riesling and Grüner Veltliner from the old vine sites of Santa Barbara. This Cali take on a traditional Austrian Riesling has that typical petrol smell that comes from aged Riesling, but getting past that you find sweet appley undertones with a citrus zing. It’s got great acidity and tension on the palate; sharp and tart, fresh and mineral, with a long lusty finish. YES. Lioco’s Sonoma County Chardonnay, 2013 (retail approx. £30), is a fabulous example of how graceful a New Californian Chardonnay can be. It’s full of fleshy stone fruits, layered with lovely acidity, and once you’ve spent a bit of time with it, it becomes a mash up of Peach Melba and Lemon Meringue Pie. Phwoar! There’s a subtle toastiness hidden in there, and a mallow-y mouth watering texture that’s both moreish and thirst quenching. I’m told this is one of the ‘entry level’ wines from Lioco, and if that’s the case, I seriously need to try more of their stuff! Our last white was Sandhi ‘Bentrock’ Chardonnay 2013, Santa Rita Hills (retail approx. £80). Sandhi - Sanskrit for ‘collaboration’ – is exactly that, a collaboration between some of biggest names in Cali’s wine/restaurant industry. Only fruit from the finest vineyard sites in Santa Barbara are used to produce the small volumes of Chardonnay and Pinot Noir, which undergo wild fermentations and see very little new oak. Located on the south-western edge of the Santa Rita Hills, Bentrock is the youngest of Sandhi’s vineyards at only 6 years old. Still, the low yielding vines are already showing their potential in delivering intensely concentrated, classy fruit. Pale and fragrant, it has quite a tight scent, which gradually keeps giving more and more. A razor sharp streak of fizz cuts through the palate, which develops into smoky, buttery, lemon curd-ish layers, all beaming with acidity. Bentrock’s beauty is reflected in the price, but it’s probably as good as many white Burgundies, which would definitely be at much higher prices! 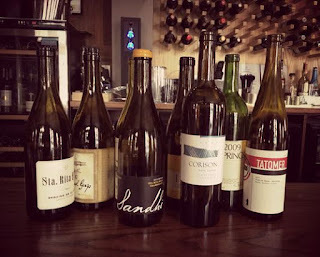 After the battle of the two Chardonnays, we voted on what we thought was the best value wine, and what we liked best overall. Unsurprisingly, the majority thought the best value was the cheapest – Viana ‘Hillside White’ at around £16 – and the favourite white of the night was the most expensive – the £80 Sandhi ‘Bentrock’. 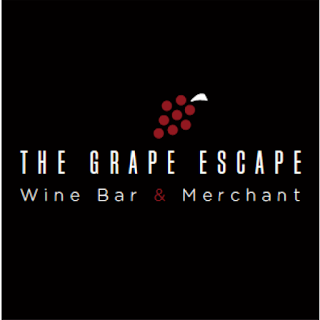 After a fine introduction to some of California’s white grape varieties and flavour profiles, courtesy of Cheltenham’s Grape Escape, we ventured on to the reds... But you’ll have to stay tuned for those next week!